Really enjoy Caroline Warfield’s Children of the Empire books. Love the historical detail. Also love the not very straightforward love stories. I was introduced to Caroline Warfield’s books when I read her first published novel, Dangerous Works, and within a few pages knew she was giving me everything I want in an historical romance. Well-rounded characters I cared about. Stories soundly grounded in historical fact, including real challenges and issues consistent with the times. Interesting plots with unexpected but logical twists. A solid passion between the hero and heroine ending in a commitment that I can expect to last well beyond the last page of the book. Each book in the Dangerous series just got better and better, and the novella A Dangerous Nativity was just plain funny, besides. I loved the three delightful boys and their plan to put on a nativity scene with animals in all the parts. You can imagine how excited I was when I first heard she was working on the Children of Empire series, in which the three boys, now grown and estranged (thanks to a vicious lying harpy), each have a book. The story of Canadian timber baron, Rand, is told in The Renegade Wife. Fred, who went into the army, meets the love of his life in The Reluctant Wife. Charles, the Duke of Murnane, appeared in the story for each of his cousins. Good as they were, each better than the last, I was holding out to hear what happened to Charles. And I wasn’t disappointed. Take everything I said about Dangerous Works and magnify it. 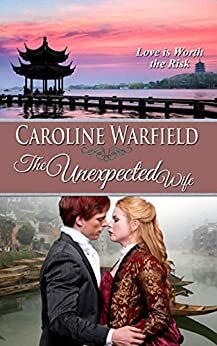 The Unexpected Wife stars my beloved Charles, as wonderful as ever, and a heroine who is worthy of him. Zambuk is brilliant, passionate, magnificent — and deeply frustrated at the constraints on her as a woman. Together, they face the challenges posed by her opium-addicted brother, rogue Western traders determined to break the Chinese ban on opium, a Chinese magistrate dedicated to stamping out the vile trade, small-minded gossip, and Charles’s wicked wife. Who could ask for more? A sigh-worthy ending goes without saying in a Warfield book. And I know I’ve said it before, but this is Caroline’s best yet. Can’t wait to see what she does in her next series. A Duke deep in melancholy from the loss of his son, an intelligent woman determined to prove she’s as capable as any man while trying to keep her brother from destroying the family name, a confrontation with an estranged spouse, a feisty landlady, Chinese unrest, and the start of the Opium War gives Charles Wheatley, Duke of Murnane, the story he so richly deserves. Be prepared to see, feel, and smell the drama and adventure as the talented Caroline Warfield gives the last of the Wheatley boys his happily ever after. I love Zambak’s determination and strength in standing up for what she believes in, even when it gets her in trouble, and boy does she find trouble. Charles and the strength he shows despite the loss he’s suffered make my heart flutter. Though at times I wanted to yell at him to forget his sense of honor and think of himself first. But then that wouldn’t be the Charles I adore. Thank you, Ms. Warfield for another well written, entertaining story! There is so much to say about this book that grabbed my heart and did not let go until the end. All of the reasons I love historical romance were found in this story that was rich in history and took me to a place not often visited, China in 1838. Charles Wheatly, Duke of Murnane was summoned by the Queen to go on a fact finding mission to China, but unfortunately if was right in the middle of the opium wars that were devastating to so many. I was so happy to see Charles get his own story and so hoped that he could find happiness. Almost broken from the death of his young son he had not been able to contain his grief. So this gives him a purpose, not only his missive from the Queen but he is also going to help find Zambak Hayden and her brother, the children of his mentor, the Duke of Sudbury. But what he finds more so much more. I loved both Charles and Zambak with each of them having their own troubles. Zambak is such a determined, strong soul that does everything she can to help her brother and others as the challenge of being in country she is not welcome. Charles is desperate to get out of China and bring her and her brother home safely. He has such a strong sense of honor and goodness that just melted my heart. Caroline Warfield has such a gift for historical descriptions and strong dimensional characters, that I could picture the surroundings and see history in the making. With several twist and turns and many surprises, the journey to the end will keep you entertained and only wanting more from this author. Well done Caroline!! 4.0 out of 5 starsAnother winner. Another winner by Ms. Warfield. I'm not real good at reviewing books - and I know that. But I felt it was important to let it be known how much I enjoyed this book. I've enjoyed just about everything this author as produced. This book had a bit more adventure than I normally care for in romance stories. But it was interesting because it was a part of history that I knew very little about (China and the Opium Wars). And it had me pulling up maps to check out the geography. And the love story was wonderful too. I've been waiting for Charles to find his HEA. From Canada to India to China, I have enjoyed all the history and the characters in this series. Would recommend this author if you are interested in more than a little romance.